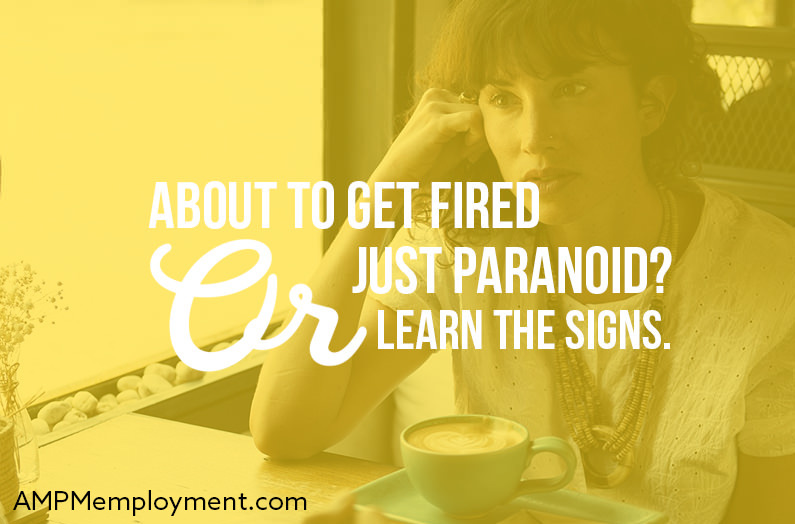 So, are you really about to get fired or just paranoid? This can be a tricky question to answer if you notice sudden changes at work. Of course, sometimes it will be obvious that the company wants you gone. More often than not, bosses will use the “burn the employee up” tactic to make them resign on their own. Still, that’s not the only scenario, far from it. There will be times when you notice the “signs” and feel like something’s up and maybe something will be up; still, it’s important to remain levelheaded. For starters, you might just feel a bit paranoid and overthink things. But, even if your feeling is right and you are about to get fired, you still need to keep your cool. This will allow you to make the most out of the situation and prepare yourself for the next step. In case the amount of writing, email documentation, and paper trails suddenly starts piling up, so much so that it drives you crazy, even though that wasn’t the case in the past, you might want to get ready for an HR review. Essentially, do your best to present yourself as a professional who’s not afraid of being “tracked down”. However, this may as well be nothing more than a change in the department’s way of doing things. Managers may have gotten orders to put everything in writing and boost email communication for easier data and project tracking. So, don’t panic if you notice this kind of a work change; but, if you think necessary, you might want to freshen up your resume, just in case. In all honesty, having tasks that would be usually assigned to you assigned to other people all of a sudden, with no proper explanation, can be a sign that the company is trying out other employees in order to see how well they can manage without you. This can be especially worrisome if you even get an explanation stating that the company wants to see if someone can do the job better than you. Obviously, you should never completely ignore the situation when you keep being left off projects. But, you might also want to calmly evaluate the situation. Maybe this is your manager’s way of lessening the burden or you may be needed on other types of projects. In case you’re really worried don’t hesitate to calmly and politely ask what’s going on. Now, it’s never pleasant to learn that you’re about to be placed on a Performance Improvement Plan (PIP). Not to mention that you’ll have to sign an agreement yourself as well. Sometimes, it could be another passive-aggressive form of making you quit of your own free will. But, even here, the question whether you’re really about to get fired or just paranoid still remains. In the end, PIP may not be a way to push you down but an actual support mechanism for the company to really better your performance and find the best direction for you. So, pay attention to what is happening and how you’re being treated. Don’t hesitate to get away if you find it necessary; but don’t disregard the possibility to utilize the situation, grow from it and completely recover either. Gossip will always be a part of every community regardless of its size and origin, office included. In that respect, feeling like you’ve been the subject of gossip at the workplace and that your colleagues have been a bit awkward around you, may indeed be the sign that something is going on and that they’ve been informed about it. Obviously, if your colleagues knew that you were to be fired, they’d probably feel a bit uncomfortable around you; they’d maybe even discuss that among themselves. That said, this may mean nothing at all – aside from the possibility that your coworkers simply like to gossip. In the end, if you really notice a considerable change in behavior that’s painfully obvious, there may really be room to worry about getting fired. But, if it feels like the change in your coworkers’ behavior differs from day to day, it may just be due to their mood in general, and not a real reason for concern. As you can see, it’s a very thin line when it comes to questioning whether you’re about to get fired or just paranoid due to circumstances. This is why it’s paramount not to jump the gun and remain calm and collected. Of course, try to prepare yourself for the worst but stay professional as this would portray a more positive image of you whatever the case.